< I found Ciedie Aech. Now you have. So I found you when you found and commented on my D. Trump comment, and, intrigued, I was led to your book, which when i clicked on the title, downloaded itself. Yesterday morning it was, and by the end of page one I was hooked, originally intending to skim and look at bits. Result: I finished it this afternoon! What a story ! I just started my blog one year ago, and got interested in the state of math in the US, with the Common Core, and gradually this led me into the blogs on the “reform” business. the more I read the worse it gets. I didn’t know that all this started with gates in 2000. I didn’t know exactly what was going on in the ‘low performing” schools. Your insight is amazing. They have been plotting this for years. “And it’s for the children” !!!!! I love the way you write. Initially puzzled by your individual use of “?”, but soon got used to it. 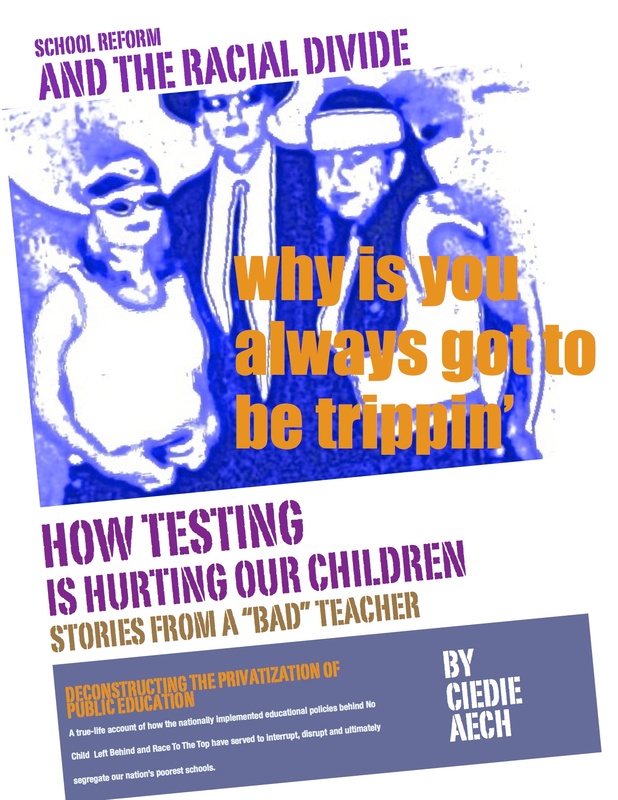 I would like to give the book a plug on my site, and if possible use your account of the not too imaginary classroom where all the time is taken up following all the edicts and mandates that there is no time to actually do any teaching. It is priceless. Oh, my. Your wonderful validation of exactly how I was feeling as I wrote and produced each of my little “sections” (they are all so personal to me) is truly a tremendous thing. THANK YOU. Please, feel free to use any part of what I have written to help others find support. None of us can do this alone. As you say, it is a thing so big, a thing plotted for years (and so well hidden) that it will take many, many voices to bring it to light. Go for it!